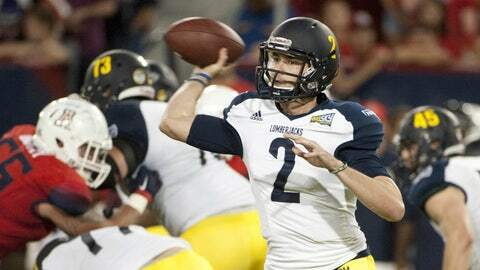 Cookus leads Lumberjacks to shootout win over Montana St.
NAU quarterback Case Cookus on Saturday threw for 244 yards and four touchdowns against Montana State. FLAGSTAFF, Ariz. — Case Cookus threw for 244 yards and four touchdowns and Northern Arizona withstood a late flurry to beat Montana State 49-41 Saturday. "I was really pleased with the way our team bounced back after a couple of tough losses," NAU coach Jerome Souers said. "Our run-pass balance was executed nicely today which is something we need to do in case they try to lock our guys down. Today was a big win for us."